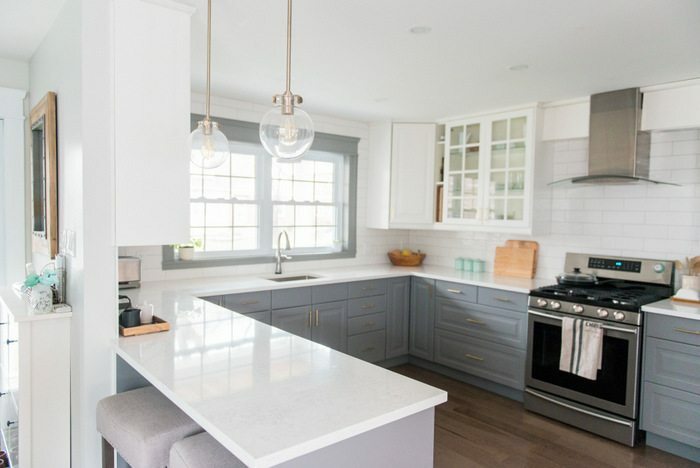 We have loved our two-tone gray and white kitchen ever since we renovated it several years ago. It still feels just as bright and fresh as when we first did it, and I can happily spend hours in there on a Sunday afternoon cooking for the week ahead or playing with my latest essential oil concoctions (you can read more about the essential oils I love and use here). But there was one thing that I had regretted. 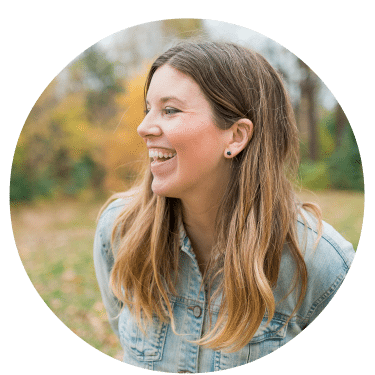 One design choice that had niggled at me and made me wish I had stuck with my gut. 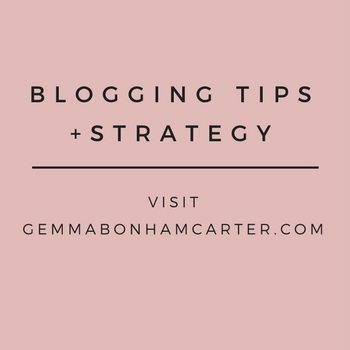 Let me explain what had been going on in my head when I was originally picking out all the finishes…. I knew I wanted to warm up the gray with some gold hardware. 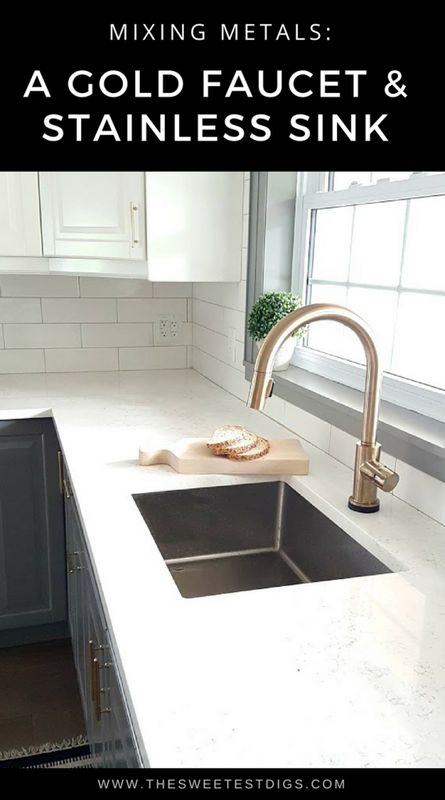 And although I loved the idea of a white farmhouse sink, I had seen them in other houses and they were covered in marks and scratches, and I had read reviews about cracking. 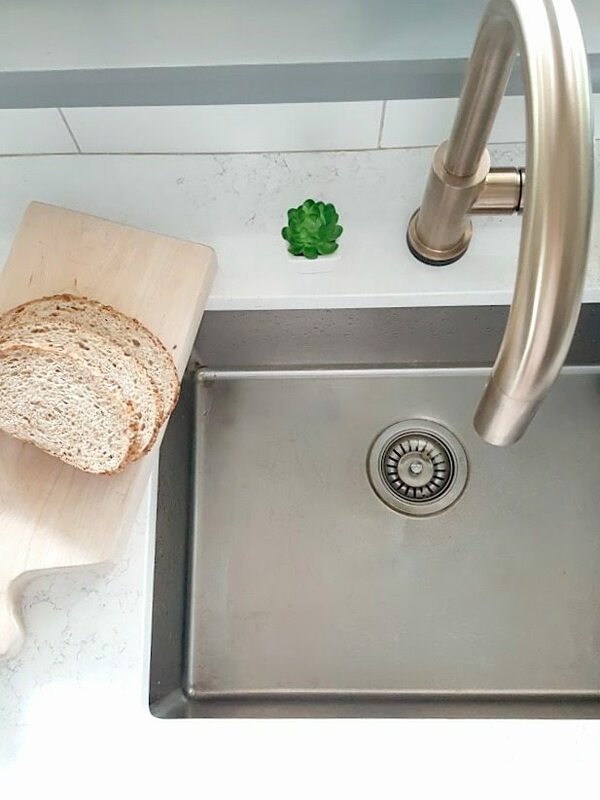 I didn’t want anything too delicate (although I know a lot of people LOVE their farmhouse sinks…), so we went with a hard-working stainless steel sink. We also chose stainless steel appliances. 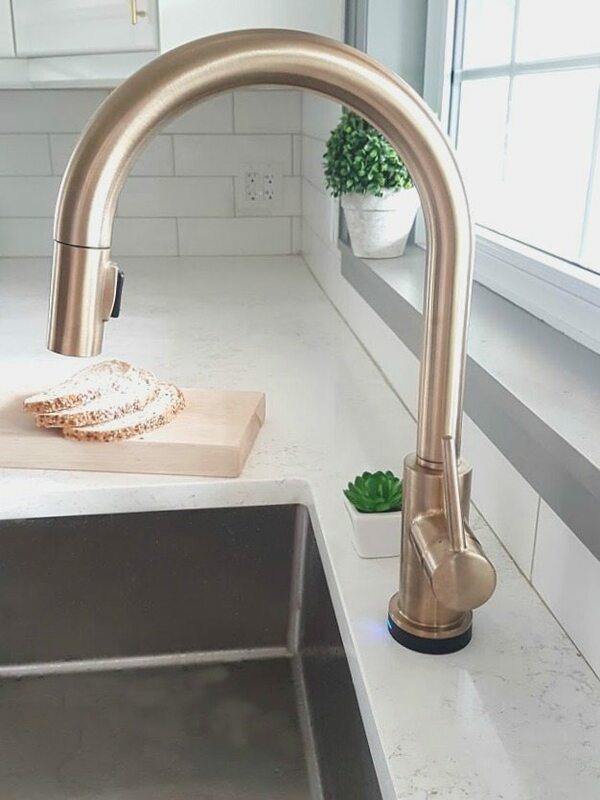 Even though I was generally OK with mixed metals in the kitchen, I figured the faucet and sink were so close to one another that I really needed them to match. I felt cornered into going with a chrome faucet. So we installed one, which you can see in this photo below. But as the design gods would have it, that faucet actually never worked properly. It did some finicky things and all the features it was supposed to be able to do, it didn’t. This gave me an opportunity to go with what I had always actually wanted, but was too scared to do: a gold faucet. 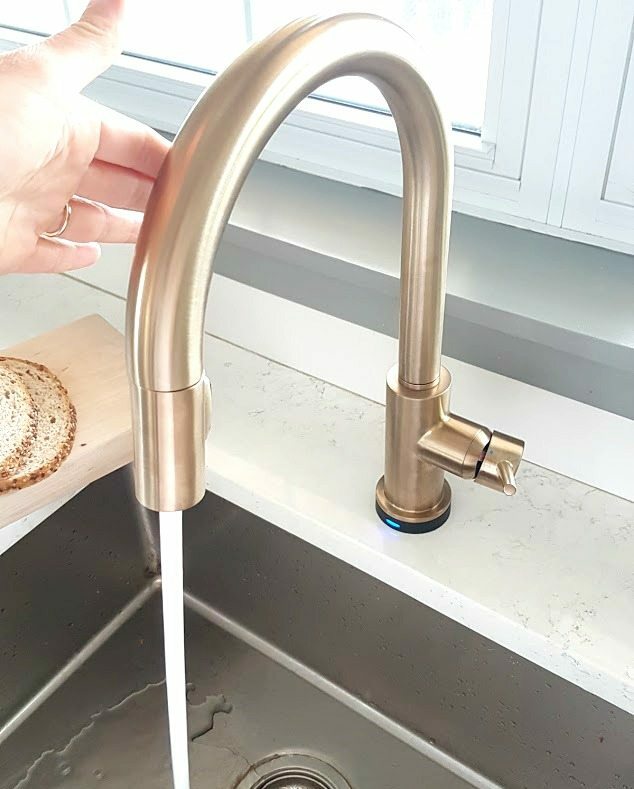 I had been drooling over the Delta Trinsic faucet for years, and when I chatted with the lovely folks over at Delta Faucet recently, they were so sweet to send us one to try out in our kitchen. I would love to tell you that I installed it myself, but my handy husband came to the rescue here and figured it all out. He also had a little helper. 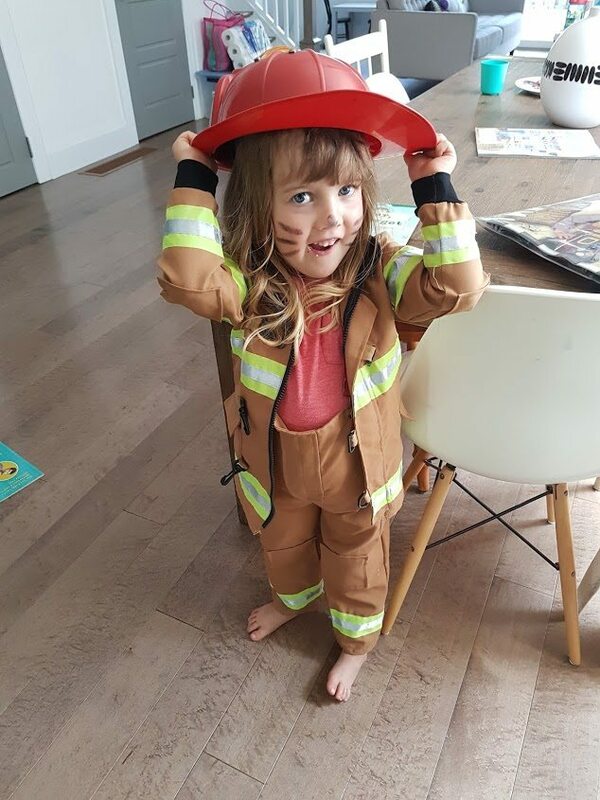 She was all ready to go… you know, in case Daddy started a fire. 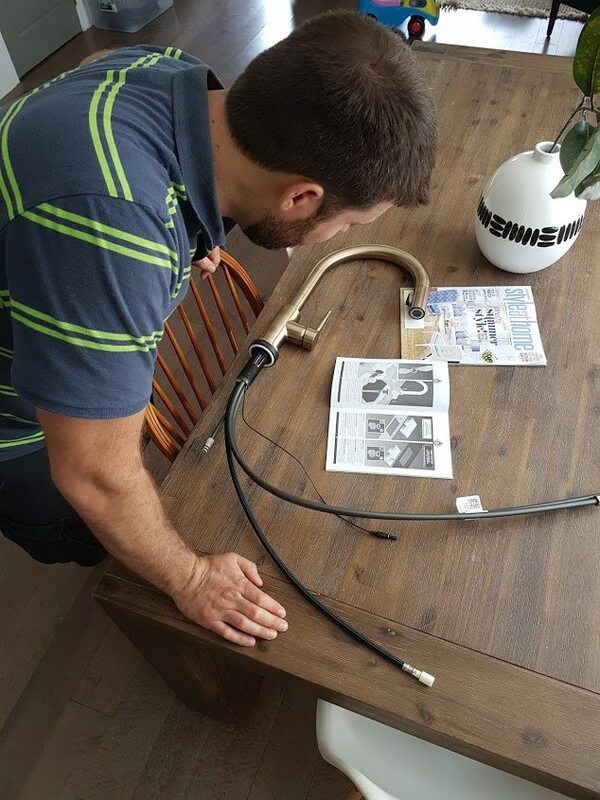 He followed the well-written instructions that came with the faucet, and it took him all of 20 minutes to get it installed. The gold is this champagne colour that is just so good. It’s not at all brassy – it’s like brass’s elegant older sister. It comes with Delta’s touch technology, which I thought was going to be kind of gimmicky but is actually amazing. Just touch the faucet and it comes on. This means that if you have fingers covered in food from baking or toddler clean-up, you can just touch it with your forearm and then wash your hands. Genius. It also has a spray feature, which is perfect for washing produce. 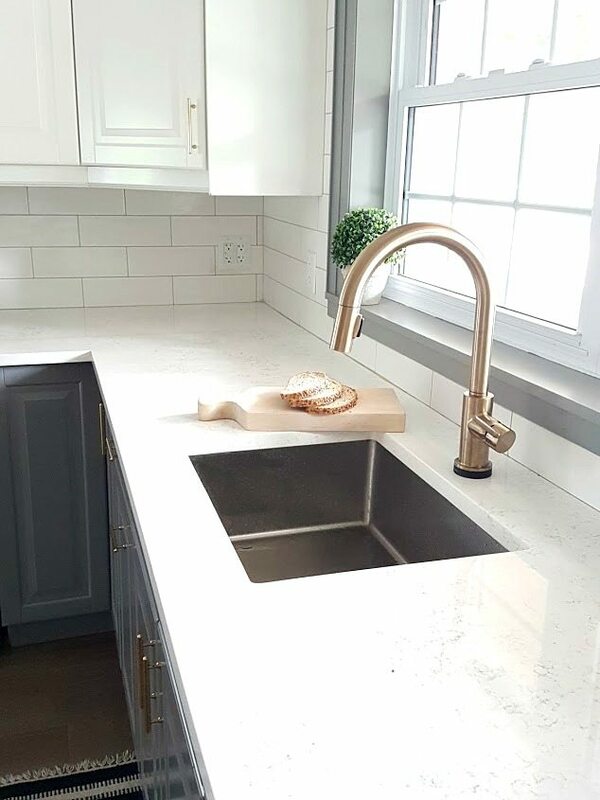 If you’ve got a big, rectangular sink like we do, then make sure you install a faucet that has the ability to stretch out. You need to be able to get water into the corners of a sink like that and you can’t do it without this functionality. 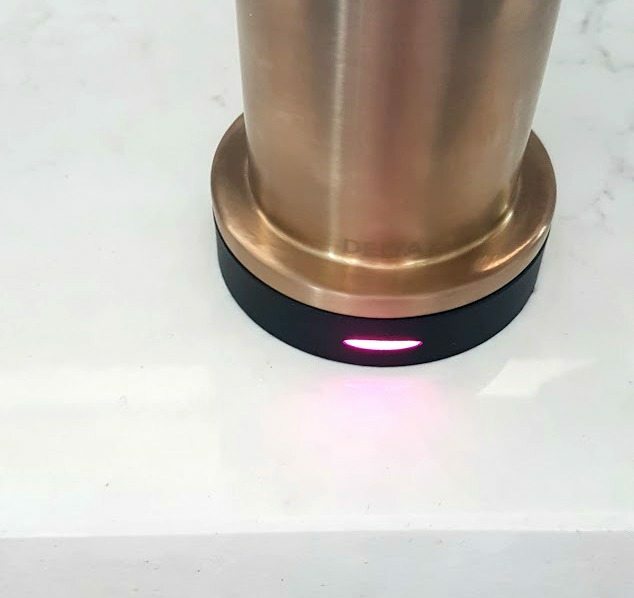 The other cool thing is that there is a little light at the base of the faucet that indicates the temperature of the water. And my worry about mixing gold and stainless so close together? Not an issue at all. I dig the look, and the way the champagne gold looks against the marble-lookalike quartz countertops is to die for. It may not seem like a big deal. But for me, who uses that faucet a zillion times a day, fixing that one design detail makes me SO happy. 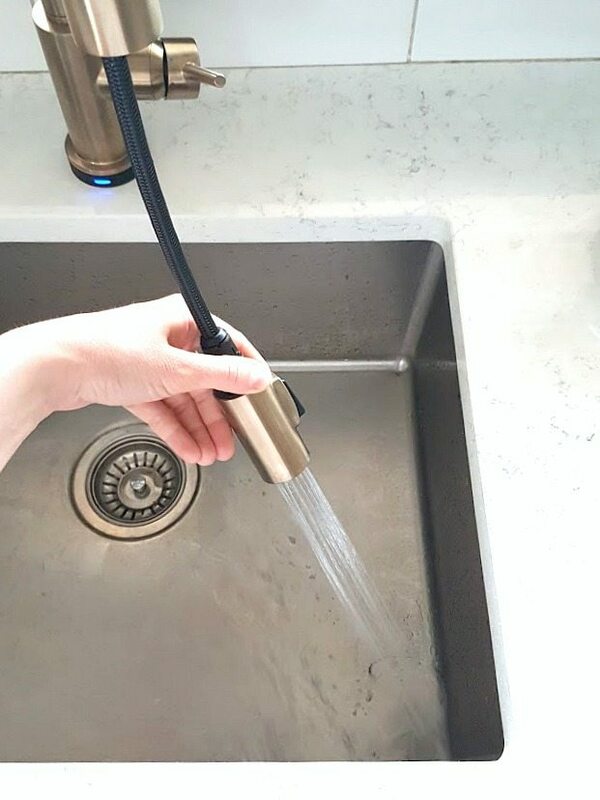 Nothing but two big thumbs up on the Trinsic Faucet from us. We love it! Get the same look in your kitchen with these finds. Wondering where we got something? Check out all the posts related to our kitchen renovation here! Disclosure: This post has been brought to you in collaboration with Delta Faucet. All opinions are, of course, 100% my own. What about you? Have you ever chosen something for a room and then almost immediately regretted it? Spill. I can’t be the only one! I think because the metals are both sort of matte, it really works!! I have a Delta Trinsic too (the pull out one- no clearance over my sink for a lovely swan faucet!!). Ive had it for 2-3 years now and it still works great! Thanks Casey!! And great to hear that you’ve been so pleased with your Trinsic too. Delta is definitely known for producing quality products! Love it. How wide is your sink? Are you happy with it or wish you went wider? Having a dilemma of 33” vs 29” width. Thanks! Thanks for this! This is exactly the info I was looking for. I’m renovating, and while I want an enameled cast iron sink, I may just stick with stainless. The one thing that feels non-negotiable though is this gorgeous copper faucet that I’ve seen. Glad to know the copper will go with either the stainless or the white sink! We are currently going through a kitchen Reno and I am leaning towards this faucet. Only, I am having trouble finding drawer pulls to match! Do you have suggestions? 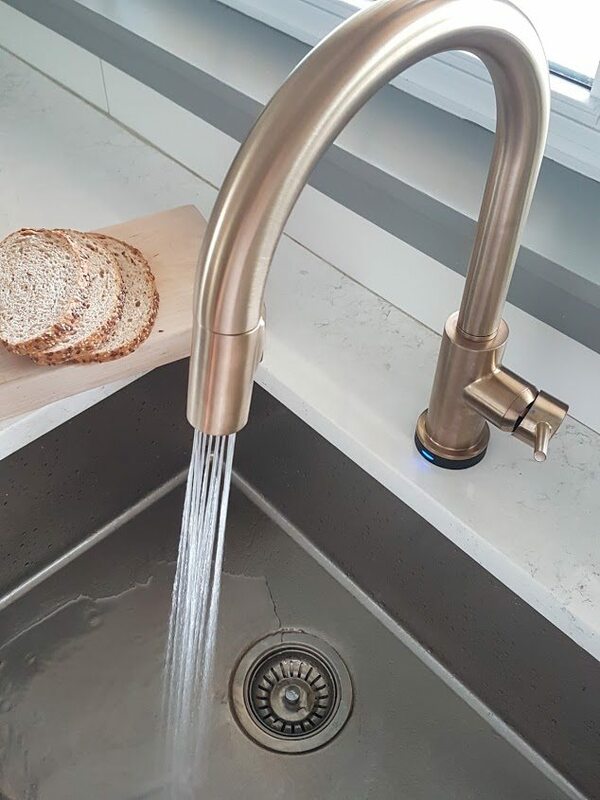 Do yours match with the tap? Thanks! I love this sink! I wasn’t looking at stainless but this looks great. 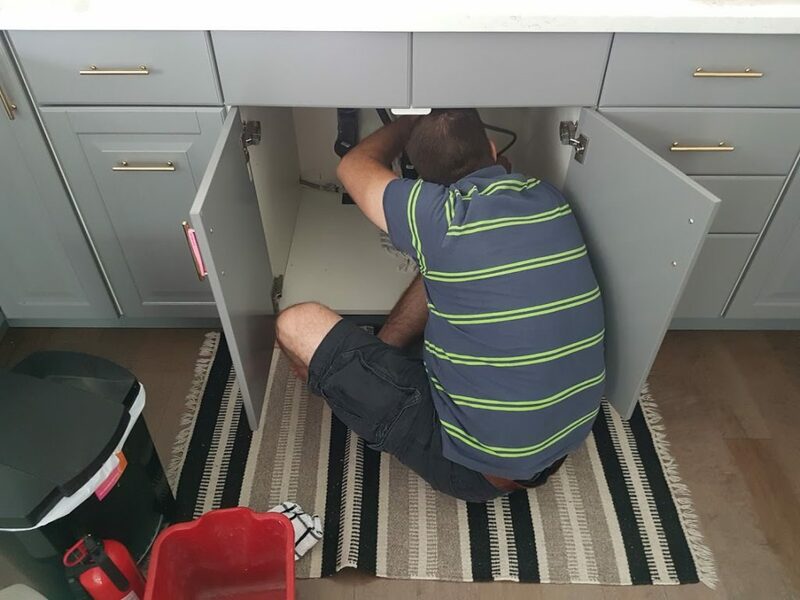 Do you have a link for the sink you bought?